Crowkillers presents us a new transmission concept for his next car in 2012 (which car will it be?...). With the transmission plate only 6 studs wide, this will easily fit into a 1:10 scale car with the same exact distance between the seats as Paul's previous models including the last Supercar Deluxe he did. For additional photos, take a look at Crowkillers BS folder. Since I doubt Crowkillers would make a model of a Subaru, it must be for a Mustang Boss 302 or something similar. I've rebuilt the gearbox from the pictures and it works pretty nicely. I only copied the gears, I completely redesigned the frame, see below as to why. I like how all axles fit in whole studs, which means easy assembly into a frame with transverse beams, rather than having to use axle joiners as was needed for 8448's design. Although there are a few disadvantages. First, I'm not fond of the double 8t combination. Second, the combination of two 24 tooth gears means one requires a pretty wide chassis to fit it all in (13 studs). But the coolest of all is that it enables for a nice improvement which I'm not sure was intentional. At least I found it a nice coincidence. If you look at the central axle, it has a 24t and a 16t and nothing else. If you move either part by a half-stud, those two gears are three studs apart. This means they can be replaced by a differential! This in turn means the gearbox can be used in combination with four wheel drive with center differential, with no changes to the gears! Maybe I should try to build a supercar around this thing, I'm confident that Crowkillers wouldn't mind. Finally something different! This is a really great design and yet it looks so simple. It is also very tight at being only 7 studs wide at the shifter axle. Nice video demonstration too. The best part is that nothing is offset like in the 8448 transmission and the ratios are a little more realistic. I see what Erik Leppen means by the 24t gears taking up space, but it looks like Paul has them hidden under where I guess the dash would be. I can see this being incorporated into many builders MOCs in the future. I didn't analyse it thoroughly, but I'm wondering why are those yellow half bushes needed, wondering if it wasn't possible to reduce one stud in the length of the gearbox (besides the fact that the lever would have to be shift half a stud to fit the clutches). Sure it could have been done differently(Believe me I tried about 1,000 wacky combinations with many more gears added)but in the end, this was the most efficient way as far as part count went. "I like how all axles fit in whole studs, which means easy assembly into a frame with transverse beams, rather than having to use axle joiners as was needed for 8448's design." Erik what exactly do you mean? I wanted to start building this, but if there is a better way, then I wouldn't mind hearing your thoughts. Sorry, English is not my native language so I might not have expressed things the way I meant. But don't worry, I haven't really made a "better" way of connecting things than the original. Crowkillers's design has no half-offset axles. This means you can just use beams to support the axles (like crowkillers has done already). This allows for a stronger frame. My only change was that if you move the section with the driving rings a half-stud forwards, then the 16t and 24t at the bottom will align in such a way that you can replace them by a differential. But you only need that if you want four wheel drive with center differential. The disadvantage is that the gear shfit plate is moved a half stud too, which makes it harder to connect (I used the same method as 8070 to connect the gear shift plate). I have built a 5+R gearbox that is only 7 studs wide and 12 long, with the half stud offset at the changeover catch and no 24T gears. It uses 17 gears which, I believe, is superior to the design shown above. 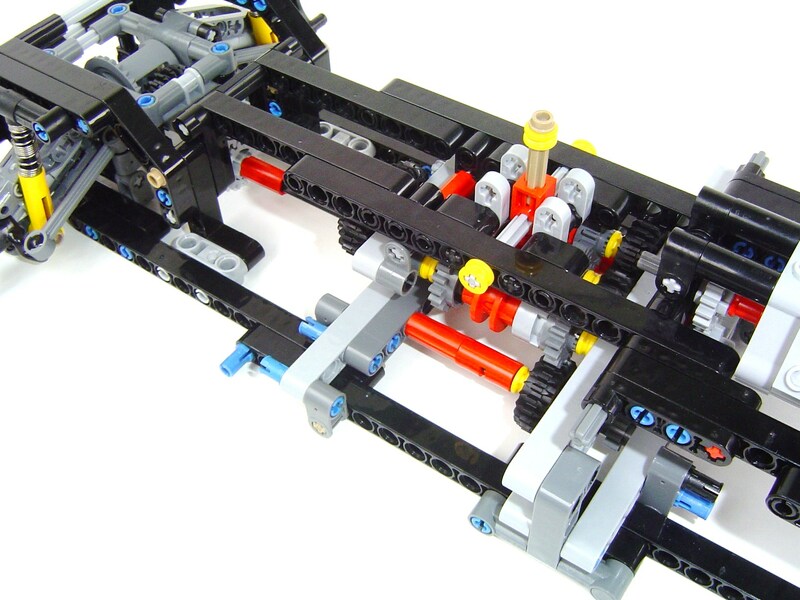 How big was 8448's gearbox?